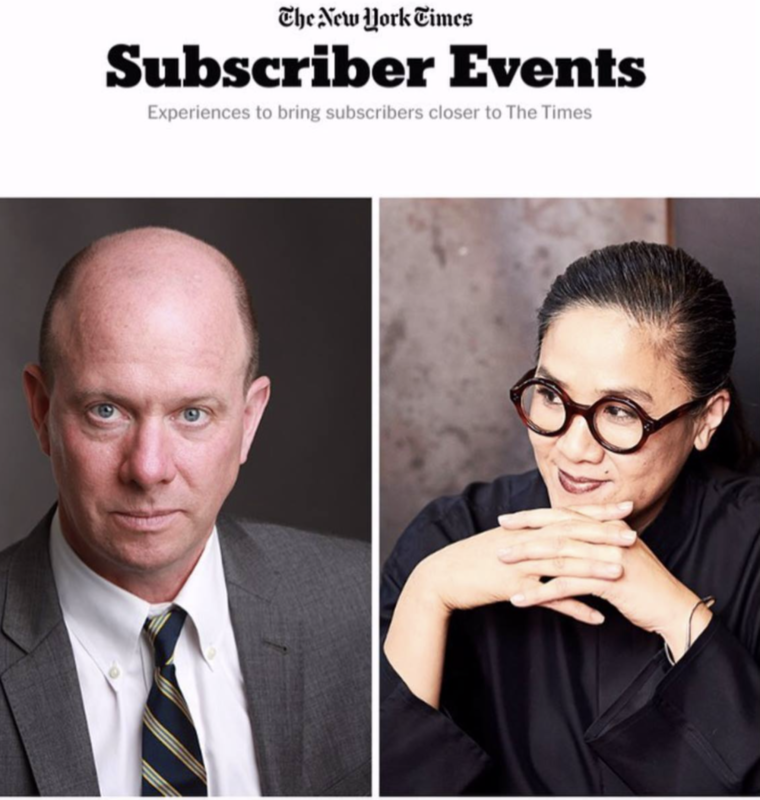 Kylie Kwong ‘In Conversation’ with Sam Sifton, Food Editor of The New York Times. Carriageworks, 6pm-7pm, Wednesday 13 March, 2019. This recipe is versatile, delicious, cooling and light for the warmer months. I love its delicate aroma and piquancy from the use of many fresh herbs and citrus. It is great served as a vegetarian side dish and alongside my roast chicken. You could also team it with cooked and peeled prawns, sticky pork belly, or grilled beef or pork ribs. Place carrot, onion and salt in a glass or ceramic bowl, mix well. Set aside for 30 minutes. Combine vinegar and sugar in a small heavy-based pan and stir over medium heat until sugar dissolves. Simmer, uncovered without stirring, for about eight minutes, or until reduced and slightly syrupy. Set aside to cool. Drain carrot and onion and, using your hands, gently squeeze out any excess liquid. Place carrot and onion in the cooled syrup to pickle them lightly. Combine pickled carrot and onion and syrup with remaining coleslaw ingredients, adjust seasoning if necessary, toss well and arrange on a serving plate. The vegetables in this recipe are chosen for their colour, texture and flavour. I love to use a lot of eggs in my fried rice – they look good, taste good and fill you up. If you are vegan, simply omit the eggs and ramp up the vegetable component. Chinese dried mushrooms also work well with their intensity of flavour. Image William Meppem, Styling Hannah Meppem. 1. Heat half the oil in a wok until the surface seems to shimmer slightly. Pour the beaten eggs into the wok and swirl them around to form a thin omelette. Cook for 1 to 2 minutes or until almost cooked through. Carefully remove omelette from wok with a spatula and drain on kitchen paper. Set aside. 2. Heat remaining oil in hot wok and stir-fry onion, ginger, mushrooms and salt for 1 minute. Add carrot, rice, beansprouts, cabbage, coriander, soy sauce and reserved omelette and stir-fry for about 1½ minutes. Use a spatula to break the egg up into smaller pieces while cooking. Lastly, toss in spring onions and sesame seeds and stir-fry for 30 seconds or until well combined and rice is heated through. 3. Transfer rice to a bowl, garnish with coriander leaves and serve immediately, with green chillies in extra soy sauce on the side. "I use American-style baby back ribs rather than spare ribs for this recipe because they are large, excellent for barbecuing, grilling or roasting, and great for wrapping your jaws around. Feel free to apply this marinade and cooking method to lamb ribs or chicken thigh fillets. The freshly sliced cucumber and citrus provides crunch and cool relief to the hot, sticky ribs." 1. Combine all of the marinade ingredients in a large bowl. Add the ribs and, using your hands, massage the marinade thoroughly into the ribs. Cover and refrigerate overnight. 2. Heat a barbecue or char-grill pan to a moderate heat and lightly brush with vegetable oil. Place ribs on grill, or in pan, reserving marinade, and cook for five minutes. 3. After five minutes, baste the ribs with a little of the reserved marinade, turn over, cover with the barbecue hood or a lid and cook the other side for three minutes. 4. Meanwhile, make the sticky sauce by placing the remaining marinade in a saucepan over medium-high heat. Add soy sauce, sugar and vinegar and bring to the boil, stirring to dissolve sugar. Cook for three minutes or until reduced by half and sticky. 5. Arrange ribs on a serving platter and spoon over the sauce. Serve with fresh cucumber and lime halves for squeezing over. These ribs make a great midweek meal when paired with stir-fried mushrooms or steamed greens and rice. "Mum would do a steamboat every Sunday night in winter when I was growing up in North Epping. The electric wok would be placed in the middle of the table and all the family would gather around and get stuck in. Sometimes we would have a steamboat on the Saturday nights my brothers and I went out clubbing. Mum would leave the wok on the table so when we returned home starving at 3am we could crank it up again and throw in some noodles. The broth only gets better as the night progresses and more things are dipped in it. I just love it – the possibilities with steamboat ingredients are endless. It's a blank canvas where you can paint a beautiful picture. Steamboats are really delicious in winter, for obvious reasons, but I still make them in summer. Australia has so much wonderful seafood and I go big on it." Serves 4 - 6 with steamed jasmine rice as a main meal. Our upcoming Sydney MAD Monday on 16 July at Carriageworks is all about resilience. The discussion on the night is part of an ongoing conversation about collaborations between cooks, servers, farmers and community leaders that contribute to a more resilient future for climate, cities, businesses and diverse communities. Our speakers for this special evening are; Caroline Baum, Josh Niland of Saint Peter, Paddington, Kuku Yalanji woman, Lydia Miller of Australia Council for the Arts, Reverend Graham Long of The Wayside Chapel and Indira Naidoo. For all those attending, MAD Australian Project Manager Bella Napier and I can’t wait to see you there. Thank you SO much to our amazing partner Lisa Havilah of Carriageworks for helping us make this all happen!🌱🌿🍃🌾 If you didn't manage to get a ticket to the event, videos of all talks will be available online following the event. Billy Kwong, Firedoor, Bert's, Hartsyard, Momofuku Seiōbo, LP's Quality Meats, Three Blue Ducks, Saga, Oakridge Wines, Africola, Biota, Icebergs Dining Room & Bar, NOMAD, Saint Peter, Chat Thai, as well as Syrian sister chefs, Sharon & Carol Salloum from Sydney's Almond Bar will all create an unforgettable dinner, serving signature dishes with a Syrian-inspired twist. #CookForSyria | Three Blue Ducks, Rosebery | Monday 18 June 6.30pm | $280 pp plus booking fee. Includes canapés, a shared Syrian-inspired feast and wine. "Tonight was totally and deliciously ... MAD! MAD is a non-profit organization that brings together a global cooking community with a social conscience, a sense of curiosity, and an appetite for change. Thank you SO MUCH René Redzepi for inspiring and educating the cooking community to find creative solutions and make a difference in their restaurants, communities, and the world at large. Thank-you so much to the amazing speakers at our first Sydney MAD Mondays; Palisa Anderson, Uncle Max Dulumunmun Harrison, Gayle Quarmby and Nicole Watson which we held this evening at Carriageworks. Thank-you also to Lisa Havilah for your unstinting support and commitment and to everyone who put their heart and soul into tonight and all of our volunteers!" KK X. For more information on our next Sydney MAD Mondays event on 16 July event visit Carriageworks. This dish is inspired by a Chinese noodle salad my uncle Jimmy brings to Kwong family gatherings. The Chinese barbecue pork pieces and pickles are my addition. My uncle uses freshly made thin egg noodles, which I prefer for this recipe because they are delicate in texture and not so filling. But feel free to choose your favourite, including Hokkien or Shanghai noodles. Look for fresh thin egg noodles in the refrigerated section of the Asian grocer. 1. Bring a large saucepan of water to the boil. Blanch celery for 30 seconds, then remove with a slotted spoon. Refresh under cold running water and drain well. Pat dry. 2. Add vegetable oil to same pan of water and bring back to the boil. Add noodles and cook until al dente. Drain and refresh under cold water. Drain thoroughly and place in a large bowl. 3. Heat sugar and soy sauce in a nonstick frying pan until sugar has dissolved. Add pork and heat through for 45 seconds or until slightly sticky. 4. Add pork and remaining ingredients to noodles and toss well using your hands. Arrange on a platter to serve. Tip: I always have a bit of barbecue pork in the freezer. It's fantastic not only for a quick, flavoursome fried rice, but also great added to noodle dishes or finely sliced and added to wonton soup. If you don't eat pork, you could add fried egg ribbons and fresh Asian herbs to make this a substantial vegetarian dish or swap the pork for cooked tiger prawns. *Remember to make the pickled carrots a day ahead (recipe below). When I was growing up, Mum used to buy Chinese pickles in Chinatown that gave instant depth and character to dishes. But these days I like to make my own – they are easy and fun to make, and enhance dishes instantly. Add these pickles to other dishes or serve alongside any meal as a condiment. 1. To make the pickling liquid, combine vinegar and sugar in a heavy-based saucepan and stir over high heat until sugar dissolves. Bring to the boil, then reduce to a simmer and cook, uncovered and without stirring, for about 30 minutes or until reduced by one-third and slightly syrupy. Set aside to cool, then refrigerate overnight. 2. Meanwhile, peel each carrot and cut in half crossways. Cut each piece into slices two millimetres thick, then into matchsticks. Place in a bowl, sprinkle with salt and mix well to combine. Cover and refrigerate overnight. 3. The next day, drain the liquid from the carrots, squeezing well with your hands. Place carrots in a 1 litre capacity airtight jar or container, pour pickling liquid over to cover, add ginger, star anise and peppercorns. Refrigerate for one day to allow flavours to develop before using. The pickled carrot will keep for up to two weeks in the fridge. This salad is also known as yee sang. The higher you toss this salad, the more good luck you'll have for the New Year! 2. Soak noodles in boiling water for 15 minutes, drain thoroughly. 3. Arrange all ingredients on a large round platter in separate piles, with the noodles in the centre, and the sashimi slices arranged on top of the noodles. 4. To serve, place platter in the centre of the table, make sure all guests have a pair of chopsticks, and pour 300ml of the dressing over the salad. Everyone must reach into the salad to mix and toss it with their chopsticks, saying very loudly "loh hei" (literally "to move upwards"). The higher you toss the salad, the better your New Year luck. Serve alongside my recipes featured on goodfood.com.au; crab and ginger dumplings and deep-fried duck as part of a Chinese New Year banquet. This versatile dressing is perfect with salads, steamed greens, roast chicken and grilled or barbecued seafood. It keeps for about three days in the fridge. 1. To make the dressing, pour vinegar into a heatproof bowl. Place sugar and water in a small pan and bring to the boil then turn the heat down to medium and allow sugar to caramelise until it is dark brown (about 2-3 minutes). 2. Just before caramel begins to smoke, remove from the heat, quickly pour into the vinegar bowl and whisk well. Add tamari and sesame oil and whisk well. Slowly drizzle in the extra virgin olive oil, whisking continuously, then stir through onion and ginger. To make the Sichuan pepper and salt dry-roast peppercorns and salt in a heavy-based pan. When peppercorns begin to "pop" and become aromatic, take off the heat. Allow to cool, then grind to a powder in mortar and pestle or spice grinder (makes four tablespoons; store in an airtight container). To make the Sichuan chilli oil place chilli flakes in a heatproof bowl. Heat oil in a small heavy-based saucepan until the surface seems to shimmer slightly. Carefully pour hot oil over chilli to release the heat and flavour. Stir to combine and set aside for at least 30 minutes to cool. Strain cooled oil mixture over a bowl through a fine sieve and discard chilli flakes. Stir in remaining ingredients, including a pinch of Sichuan pepper and salt, to combine and set aside. 1. Place all the dumpling ingredients (except wonton wrappers, Sichuan chilli oil and Sichuan pepper and salt in a bowl and combine well. 2. Next, fill and shape the dumplings by placing a rounded teaspoon of the filling in the centre of a wrapper. Dip your finger in water and moisten the edges of the wrapper. Gently lift one side of the wrapper and fold in half over the filling to the opposite side. Lightly press around filling and along edges to seal. Repeat with remaining wrappers and filling. Set the 16 dumplings aside in a single layer on a tray lined with baking paper. 3. Bring a large saucepan of water to the boil. Drop dumplings into the water a few at a time and boil for 2½ minutes or until cooked and wrappers are translucent. To test that the dumplings are ready, remove one and cut into it with a sharp knife to check that the filling is hot. When dumplings are ready, remove with a slotted spoon and drain onto a plate. 4. Arrange dumplings on a platter and serve immediately dressed with Sichuan chilli oil, garnished with the native sea blite and sprinkled with the Sichuan pepper and salt. Serve alongside my recipes featured on goodfood.com.au; deep-fried duck and good luck salad as part of a Chinese New Year banquet. The season of spring at Billy Kwong always calls for an asparagus stir-fry, sliced and cooked very lightly and quickly. It is interesting to use salt sometimes as the flavour enhancer, rather than using soy. This method is also great with fresh snowpeas, zucchini flowers, bok choy or Chinese white cabbage. 1. Wash asparagus, trim and discard woody ends. Peel lower parts of stems, if necessary, and slice stems in half on the diagonal. Wash and drain well. 2. Heat peanut oil in a hot wok until the surface seems to shimmer slightly. Add garlic and salt and stir-fry for 10 seconds. Add asparagus and stir-fry for one minute. Add wine or sherry and stir-fry for 30 seconds. Pour in stock and stir-fry for a further 30 seconds or until asparagus is just tender. Lastly add sesame oil and serve immediately. I usually try to source Queensland saucer scallops for this dish, with their firm-medium, flavoursome flesh. Be sure to pat the scallop meat dry with a paper towel to remove any excess moisture before cooking and only cook this dish "a la minute" – the scallops should be rare and the snowpeas bright green and crunchy. You could of course substitute fresh green prawns for the scallops. If you are allergic to peanuts, use vegetable oil. 1. Combine soy sauce, vinegar, sugar and sesame oil in a small bowl and set aside. 2. Heat peanut oil in a hot wok until the surface seems to shimmer slightly. Add scallops to wok, in two batches if necessary, and sear for 30 seconds on one side, then turn over and sear the other side for 10 seconds so they are nicely caramelised. Remove and drain on kitchen paper. 3. Add snowpeas, spring onions and ginger to wok and stir-fry for 30 seconds. Add wine or sherry and cook for 10 seconds. 4. 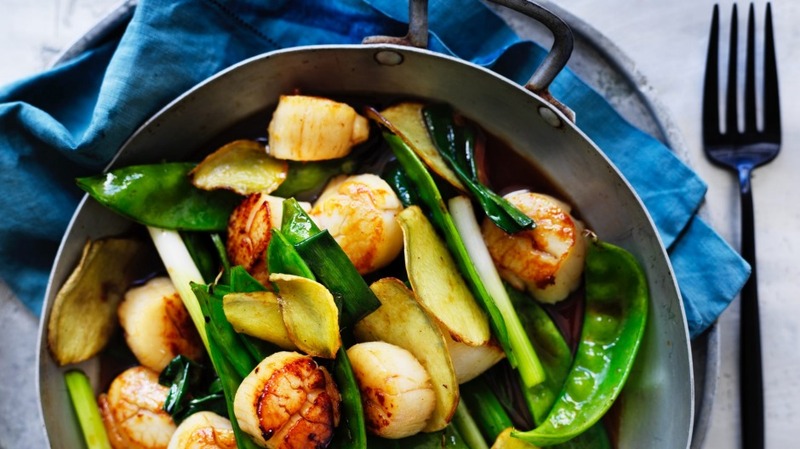 Return scallops to wok, add soy sauce mixture and stir-fry for 30 seconds. Serve immediately. This dish is best cooked "a la minute" so make sure you have all of your ingredients prepared, your serving plate with lettuce cups and fresh herbs ready to go, and your guests seated before you begin frying the squid. It only takes a few minutes to cook and is so delicious eaten piping hot. 1. First, clean and score the squid (see step-by-step guide below). 2. In a large bowl, combine flours, salt, chilli powder and Sichuan pepper. Add squid and toss to coat, shaking off any excess flour. 3. Heat oil in a hot wok until surface seems to shimmer slightly. Add half the squid and deep-fry for about 1½ minutes or until just tender and beginning to colour. Remove with a slotted spoon and drain well on kitchen paper. Repeat process with remaining squid. 4. Arrange chilled lettuce cups on a platter and top with squid. Serve immediately with lime halves and fresh herbs. 1. Gently pull the head and tentacles away from the body and discard the entrails. 2. Cut the tentacles from the head just below the eyes. Reserve the tentacles and discard the head. 3. Remove and discard the fine, purplish-black membrane from the body. 4. Trim the side "wings" from the body and set aside. 5. Pull out the clear "backbone" (quill) from inside the body, then rinse body, tentacles and wings thoroughly and pat dry with kitchen paper. 6. Cut squid down the centre so that it will open out flat. 7. Using a sharp knife, score shallow diagonal cuts in a crisscross pattern on the inside surface, taking care not to cut right through the squid. Scoring squid makes it curl on contact with hot oil, while also allowing flavours to penetrate into the squid. 8. Cut the scored squid in half and then into four-centimetre strips. 9. Trim the reserved "wings", then cut in half. You can use any type of noodles in this soup, including fresh rice noodles, thin egg noodles and Shanghai noodles. Serves 4. 1. Remove cores from bok choy, cut crossways into four, then wash thoroughly and drain. 2. Place noodles in a colander and rinse well under hot running water, then drain. 3. Bring stock to the boil in a large heavy-based pot. Add soy sauce, ginger and sugar and stir to combine. 4. Reduce heat, add drained noodles, and simmer gently for 30 seconds. Add bok choy and chicken and simmer for a further two minutes or until chicken is cooked through. Stir in sesame oil, then remove pot from stove. 5. Ladle soup into large bowls. Place spring onion and chilli in a separate bowl and serve alongside the soup. This dish goes with Kylie's 'Rich Chinese Stock' (below). I like to use a whole free-range chicken to create an intense, richly flavoured and textured stock. Strained and lightly seasoned with soy and infused with ginger, this soup is clean-flavoured, sustaining and a great meal in its own right, or you can use it in other dishes. 1. Rinse chicken and trim away excess fat from inside and outside cavity. Cut chicken into about 10 pieces and place in a large stockpot, along with all the remaining ingredients. Bring to the boil, then reduce heat to a gentle simmer, skimming the surface with a ladle to remove any impurities. 2. Turn down heat until surface of the stock is barely moving and cook for two hours, skimming as required. 4. Strain stock through muslin (or a clean Chux) and store, covered, in the refrigerator for up to three days or in the freezer for 2-3 months.